From the acclaimed producer of Gone with the Wind comes a torrid tale of passion and romance that's loaded with "all the sweep and panache of a giant American action movie" (The New Yorker)! "Flawlessly cast" (The Film Daily) with a bevy of film legends, including Jennifer Jones, Gregory Peck, Joseph Cotten, Lionel Barrymore and Lillian Gish, this salacious saga is "virtually impossible not to love" (The Hollywood Reporter)! When her father is hanged for murdering his wife, the stunning beauty Pearl (Jones) is taken in by a wealthy Texan, his wife and their two grown sons (Peck and Cotten). But Pearl soon becomes trapped in an emotional tug-of-war between her love for one son and her lust for the other, igniting the most tempestuous triangle the West has ever seen! If you're going to tell a tall Shakespearean tale of romance, betrayal, and family, you need to have a big backdrop. You need a location with the expanse to cover such broad themes. So, why not the old west? What better place to tell the story of dueling brothers fighting for the love and respect of not only the same woman but their ailing father? In 1946, hitmaker David O. Selznick picked up the rights to Niven Busch's novel Duel In The Sun in an attempt to outdo his masterpiece Gone With The Wind. The film boasts a terrific cast including Joseph Cotten and Gregory Peck as brothers with opposite tendencies vying for the love of a beautiful woman played by Jennifer Jones and the respect of their father played by Lionel Barrymore, but great performances aren't enough to escape the film's cheap harlequin dime store romance novel tendencies. After her father is convicted of killing her mother and her mother's lover, downtrodden Pearl Chavez (Jennifer Jones) is hustled off to start a new life in Texas living with her distant relatives the McCanles. Senator Jackson McCanles (Lionel Barrymore) is king of his cattle ranch and the land that surrounds it. What he says is what goes. His son Jesse (Joseph Cotten) has gone on to become a lawyer to appease his father's will while his reckless younger brother Lewt (Gregory Peck) is content to squander the good name boozing, gambling, and womanizing when he's not herding cattle. The McCanles lives were going along the dusty trail just fine until Pearl arrives on the stagecoach. Her beauty and strong-willed nature draw the attention and lust of Jesse and Lewt while earning the anger of Senator Jackson. I guess when it comes right down to things that you can't really fault Selznick for trying to replicate his past glories. Gone With The Wind was a career-defining production that, adjusted for inflation, is one of if not the highest grossing films ever made. Everyone went to the theaters to see it. That's a lot of pressure for any creative force let alone for a guy responsible for King Kong, Rebecca, and A Star Is Born. However, the biggest problem with Duel in the Sun is ego. As a pet project that gestated for over a decade, Selznick blew a small fortune producing it, cast his wife Jennifer Jones in the lead, and burned through seven directors during production before King Vidor would get final credit. Perhaps the best way to describe Duel in the Sun is a trashy masterpiece. All of that money Selznick spent on the production is on the screen for the audience to see. It has terrific production values, a massive scope, and all of is captured on the screen in glorious Technicolor. However, the story of dueling brothers fighting for their father's approval with a gorgeous lusty woman caught in the middle is just silly B-movie romance hokum. As the ridiculous plot unfolds, as lusty meaningful glances are exchanged, as passions boil over, you do a lot more eye-rolling and chuckling than you do appreciating the story intricacies. What should be drama and suspense end up being a well-acted and staged bit of hilarity. You can't blame the cast for this one either. Jennifer Jones is definitely a beautiful woman and she's doing her best with this material, but her Oscar-winning talents are better suited elsewhere. Lionel Barrymore is always great turning in another great performance as the elder McCanles. Joseph Cotten is maybe a bit too stiff and rigid as Jesse, but he proves to be a great counter balance to Gregory Peck's free-spirited Lewton. The cast is there, the grand backdrop is there, but the story mechanics just don't require the expensive trappings this production afforded. 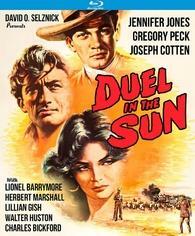 Duel in the Sun isn't a bad movie, nor is it a great one, but it is entertaining. It's worth seeing for sure, but don't expect much more than surface level amusements. It's a silly film that tries very hard to be an undisputed classic. Duel in the Sun arrives on Blu-ray courtesy of Kino Lorber and their Studio Classics label. Pressed onto a Region A BD-50 disc, the disc is housed in a standard Blu-ray case with reversible artwork. Also included is a booklet containing cover art for other Studio Classics release. The disc loads directly to a static image main menu with traditional navigation options. Duel in the Sun arrives with a middling 1.33:1 1080p transfer. Grain has been retained giving the film a nice film-like appearance. Details waiver from strong to soft depending on the shot. One moment you're enjoying a terrific display of fine facial features, costuming, and production values, the next, the image can appear overly soft lacking definition. Colors have that lovely Technicolor pop to them, but again depending on the shot and scene can look a bit bleached. Likewise, skintones are relatively accurate, except for Jennifer Jones who had to wear an amount of obvious skin coloring to make her appear as a half white half Mexican woman. Black levels are also a bit on the hazy side of things so depth can be a bit of an issue. Print wear and tear is evident with speaking, scratches, and a few skipping frames around 90 minutes into the film. Considering the film's age and that it clearly hasn't undergone an earnest restoration effort this presentation isn't half bad. Similar to the image transfer, the English DTS-HD MA 2.0 mix supplied suffers from some age-related issues. Hiss is audible. Dialogue can waver from strong and clear to being a bit soft and undefined when stronger amounts of hiss intrude. Likewise, scoring from Dimitri Tiomkin and sound effects can come through a bit tinny and hollow when they should be rousing and engrossing. There's a notable lack of power throughout. Again, it's not terrible. You shouldn't have a difficult time knowing or hearing what's going on, but without an expensive restoration effort, this track is probably going to be the best you're going to get. Duel in the Sun comes with a pretty solid assortment of bonus features. The commentary track from Gaylyn Studlar is particularly interesting and provides a lot of great info about the production and the film's reception. The Interviews with Gregory Peck's family is also a great inclusion for barely 10 minutes of footage. All around this is a pretty great bonus feature package. Audio Commentary Featuring film historian Gaylyn Studlar. Duel in the Sun is entertaining in that cheap tawdry sort of way that only a bad romance novel brought to life could bring to the big screen. The fact that it was also such a lavish production under the watchful eye of David O. Selznick makes it all the more interesting to watch. Jennifer Jones and Gregory Peck are the real draws of the film - even if their torrid on-screen romance and the familial drama is a bit silly. Kino Lorber Studio Classics brings the film to Blu-ray in flawed but serviceable shape and features a nice assortment of bonus features. It's not a great movie but it's certainly watchable. Worth a look.